Aberdeen's Europa League opponents Maribor are mourning the deaths of two young players in the build-up to Thursday's second leg of their third qualifying round tie. Damjan Marjanovic, 20, and 21-year-old Zoran Baljak were killed in a road crash, the Slovenian club said. A Maribor statement said the news has "shattered us deeply". "A cruel fate has intervened in its severest form and taken away two young members of our Violet family." Marjanovic and Baljak were both in the B team at Maribor. 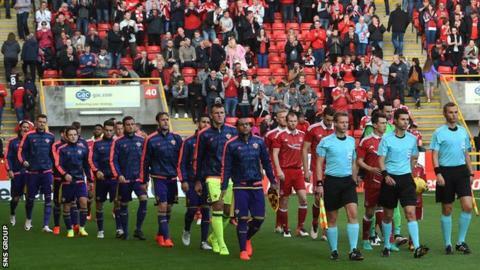 Aberdeen, who visit Slovenia following a 1-1 draw at Pittodrie, said they were "deeply saddened" by the news. Chief executive Duncan Fraser said: "I spoke with my counterpart Bojan Bon this afternoon and have passed on our condolences from all of the Aberdeen family. "This puts everything into perspective. The clubs have developed an excellent relationship in the build-up to the games and we will co-operate fully with any wishes that NK Maribor may have to mark this tragedy."